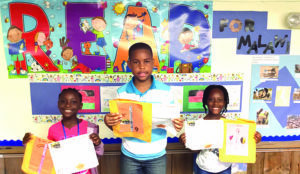 Three students from the Brownell Mountain School on St. George Road in Williston recently completed a ‘Read for Malawi’ challenge. For the month of May, Dahlia Michoma, Ajhauni Graham and Hailey Michell (pictured from left to right) rallied for sponsors to donate $1 for every book they read. Together, they were able to collect $40 by reading 40 books. Through additional contributions from parents and members of the Williston Seventh Day Adventist Church, the total was increased to $184. All donations went to the Adventist Development and Relief Agency to benefit the country of Malawi. The students were inspired to give to Malawi based on a book they read called ‘Galimoto’ about a boy who lives in a village in Malawi. Through reading this book and other research, the students learned that Malawi is one of the poorest countries in the world and in need of help with agricultural development and nutrition. The Brownell Mountain School is located in the Williston Seventh Day Adventist Church.